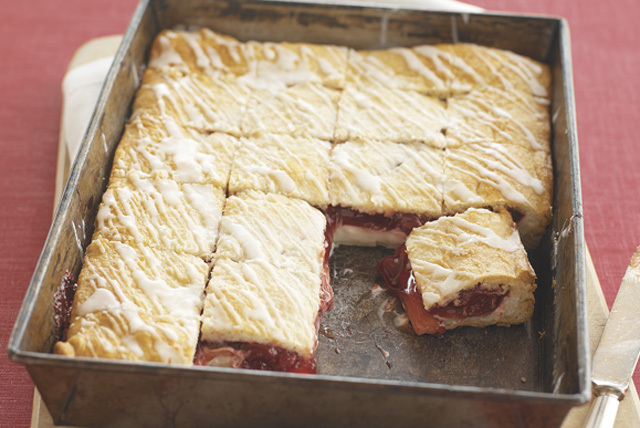 Simply roll out dough and fill with two favourite danish flavours-cream cheese and cherry. Preheat oven to 350°F. Unroll 1 of the cans of crescent dough. Place in greased 13x9-inch baking pan; press onto bottom of pan to form crust, firmly pressing seams together to seal. Beat cream cheese product, 3/4 cup of the sugar, the egg white and vanilla with electric mixer on medium speed until well blended. Spread onto crust; cover with pie filling. Unroll remaining can of crescent dough onto large sheet of wax paper. Pat out dough to form 13x9-inch rectangle, pressing seams together to seal. Invert over pie filling to form top crust; discard wax paper. Bake 30 to 35 min. or until golden brown. Cool at least 20 min. Gradually add milk to remaining 3/4 cup sugar, beating until well blended and thick. Drizzle over warm dessert. Cut into 24 rectangles to serve. Store leftover dessert in refrigerator.